The Jousting Life: Announcement for "The Tournament of the Phoenix 2012"
Announcement for "The Tournament of the Phoenix 2012"
“The Tournament of the Phoenix”™ is a two day invitational jousting tournament where highly skilled jousters compete for the coveted Phoenix prize. This event is not a performance or re-enactment. This is a sports contest, the original 'extreme' sport. This year's tournament will take place in Poway, California, USA on October 26-28th. Six jousters from the USA, England, Canada and France will compete against each other in foot combat with axes, mounted melee and four sessions of jousting. The popular “Festival of History” complements the Tournament, providing a host of activities for all ages and interests. Costumed interpreters inhabit fully outfitted period camps spanning Rome to the Renaissance. With live music as well as demonstrations from blacksmithing and falconry to glass blowing and gladiatorial combat, this event provides fun, food and excitement for all! Skill at Arms competition – 8 West-coast competitors demonstrate their prowess with lances, swords, spears and other weaponry as they accumulate points in 9 events over 3 days. Gladiators! – Watch authentically armoured gladiators fight in 2 demonstrations a day. Glasswork – Stained glass and lampwork demonstrated on site. Local artisans – This year, the tournament has made a commitment to assure most vendors are local artisans. Start your holiday shopping and support a local artist! Pony rides and petting zoo from Zoo4You. More than 8 registered charities have been given free spaces to spread the message about their focus: Make a Wish, Uganda education, animal rescue, historic horses, birds of prey and more. 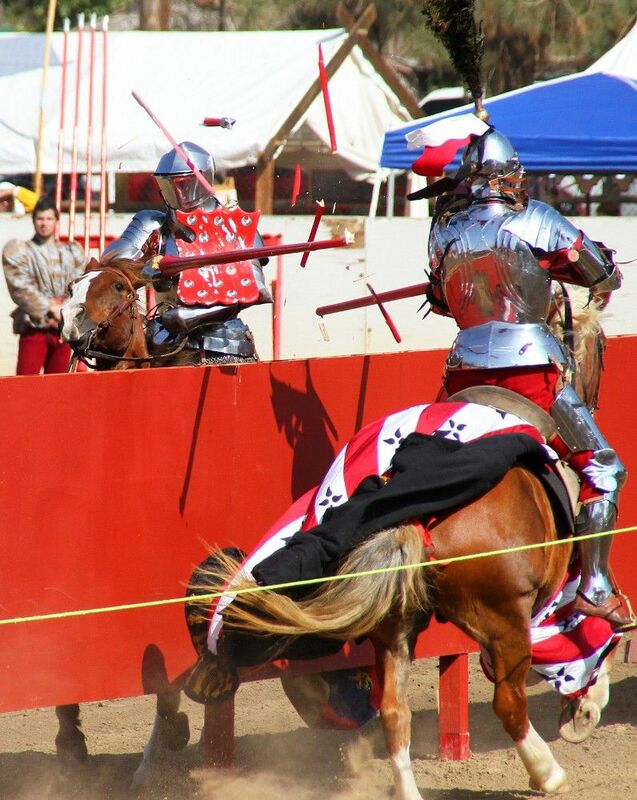 The name of this tournament was coined during the first WorldJoust Tournaments™ event in October 2007. When the Witch Creek fires devastated Southern California, most of San Diego – including the event organizers and an early arriving competitor – were evacuated, and it seemed the event would have to be canceled. A decision was made to put the event on anyway, and hundreds of area residents turned out to enjoy an entertaining day away from the cares and worries that had plagued so many. Surrounded by a sea of smiling faces, English competitor Dominic Sewell declared,”We thought the fires would defeat us, but instead we have risen, phoenix like, from the flames.” And so "The Tournament of the Phoenix" was named. Since that first tournament in 2007, the event has grown, adding more competitions, displays and exhibitors every year. It has established itself as a unique and valuable opportunity for students and their families to experience history. You can find out more about this event by visiting "The Tournament of the Phoenix" website.